Sometimes it is obvious when a parent is impaired. Other times you might suspect something is wrong but you don’t have a mechanism to confirm it, especially when you don’t live together. Without the assistance of the court, it can be difficult to monitor. Parents in denial about their substance abuse tend to create a facade that everything is fine, like a house of cards ready to collapse with the slightest breeze. 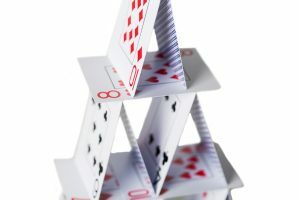 When the House of Cards Falls: What Can You Do by Agreement? In this article the term “parent” includes anyone with visitation and/or custody rights, substance abuse is abbreviated as “SA” and the law is that of North Carolina. Occasionally, a parent gets a wake-up call after being served with a summons and complaint or motion for child custody that recites the other parent’s serious concerns about SA in black and white. If that parent recognizes he or she has a problem, it is possible to enter a court order by consent and without a trial, subject to approval by the judge. Such an order can require the parent to go to a detox facility, pain management facility for addiction to pills and prescribed medications, counseling or other treatment. The order can condition visitation on successful random drug or alcohol testing and/or confirmation from the treatment facility or SA professional that the parent has kept all scheduled appointments. Supervised visitation can be ordered, depending on the availability of a willing third party to supervise or the availability of supervised visitation or exchange facilities. When the House of Cards Falls: What Can the Judge Do? Judges have the authority to do whatever is required to protect a child, including emergency custody orders if there are grounds for doing so. Parents with SA usually leave some path of evidence, sometimes by conviction of crimes such as possession of a controlled substance or DWIs. Other times, a careless parent might do something as simple as failing to take a child to school on time, more than once. You can ask the court to enter an order requiring the parent to do the things discussed in the above paragraph. The court also has the ability to require the other parent to submit to a physical or mental examination. An example of this is an order requiring a parent to have a substance abuse assessment, analyzing a parent’s fitness to care for a child. A judge can award visitation rights on the condition that the parent abstains from consuming alcohol. If the parent consumes alcohol, his or her visitation is suspended. Now, judges have express authority from the family law statutes to require the parent to submit to “a continuous alcohol monitoring system…to verify compliance with this condition of custody or visitation.” The system must be the type approved by the NC Division of Adult Correction. If the court enters an order requiring this, the judge must order the “monitoring provider to report any violation of the order to the court.” The provider is also obligated to notify both parents of the violation. NC Gen. Stat. §50-13.2(b2). If Child Protective Services verifies a report of abuse or neglect, it can file a petition for the court to enter an order placing the child in the custody of the Department of Social Services or foster care, if necessary.